Takeaway: You can plan your daily schedule so that different habits support each other, maximizing the benefits you receive from all of them. Joel Gascoigne, the founder of Buffer, is famous for st.. Need help getting started with Lift? Read our quick tutorials. Have another question? Ask us or send feedback. We’ll ask for your name, email, and password when you register ..
We’ll ask for your name, email, password and timezone when you register for a Lift account. If y..
At Lift, we’re looking for ways to help you achieve your goals by breaking them down into simple habits that you can track. There’s no better time to reflect on your goals and your plans to meet the.. Earlier this week we put out a big release to support New Year’s Resolutions. It was definitely the biggest release we’ve done since we’ve launched. Today’s release is a set of incremental improveme.. 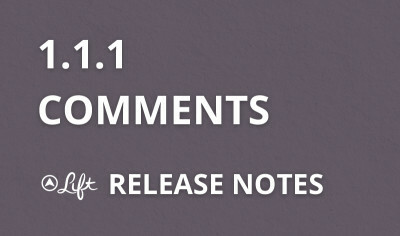 The short summary for this update: we’ve added comments. You can see them in the App if you download the latest update. Here’s the longer answer. It has to do with our theory of behavior design. Lift is working to push the boundaries of human potential. We’re a seven person startup based in San Francisco.Our first product is an iPhone app and we just released two new versions: a website and..
What if you could achieve any goal that you set in front of yourself? In the spring of 2010, Jesse Schell, a professor of game design at Carnegie Mellon, gave a talk about how game-like features wer..